538 pages | 16 Color Illus. | 230 B/W Illus. The development of molecular electronics has become the mainstream of scientific research in recent decades. Applications include light-emitting diodes, solar cells, thin-film transistors, and sensors, among others. New-generation organic materials possess the virtues of softness, light weight, easy processing, design flexibility, and so on. This book focuses on the preparation of new functional organic materials. It includes a brief theoretical/kinetic discussion. The text lays special emphasis on the design of organic structures and the way they perform the designated functional properties. It will help organic chemists, particularly synthetic chemists, to light up their inspirations. 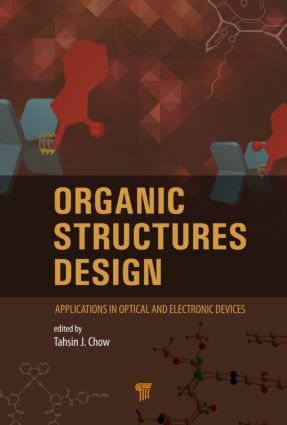 "Presenting an overview of the syntheses and properties of organic molecules and their applications in optical and electronic devices, this book covers aspects concerning theoretical modeling for electron transfer, solution-processed micro- and nanomaterials, donor–acceptor cyclophanes, molecular motors, organogels, polyazaacenes, fluorogenic sensors based on calixarenes, and organic light-emitting diodes. The publication of this book is timely because these topics have become very popular nowadays. The book is definitely an excellent reference for scientists working in these areas." Tahsin J. Chow is a research fellow in the Institute of Chemistry, Academia Sinica, Taiwan, and an adjunct professor in the Department of Chemistry at National Taiwan University. He obtained his BS from National Taiwan University in 1972 and a PhD from the University of Cincinnati, USA, in 1980. Prof. Chow has been an Alexander von Humboldt scholar in 1988–1989 and became a fellow of the Federation of Asian Chemical Societies in 2005. His research interests are in the field of organic and physical organic chemistry, and in recent years, he has especially focused on organic electronic materials.